Gorgeous beaches and nature areas, first-rate museums and cultural sites; state-of-the-art sports and entertainment venues make up the impressive list of attractions in Corpus Christi. Looking to spend some time soaking up the sun? Take your pick of nine beaches, including North Beach, Mustang Island State Park, and the Padre Island National Seashore. How about fishing? Check out the one-of-a-kind Bob Hall pier at Padre Balli Park. For history, tour the USS Lexington Museum on the Bay or browse the exhibits at the Corpus Christi Museum of Science and History. All of the attractions listed below provide a variety of ways to enjoy your time in the largest coastal city in Texas. Read on to find out what Corpus Christi has to offer. Corpus Christi’s American Bank Center is the largest entertainment center and event venue that hosts concerts, sporting events, trade shows and a variety of conferences all year long! It’s the home of the North American Hockey League’s Corpus Christi IceRays and the Texas A&M-Corpus Christi Islanders men’s and women’s basketball teams. A full schedule of upcoming events is always available on the venue’s website. The Art Center of Corpus Christi is home to local art in the Coastal Bend. The facility brings together four pleasures: viewing art in its seven galleries, shopping in the Gift Gallery and local artists’ studios, dining in the restaurant and of course, the creation of wonderful art. The Art Center is dedicated to the purpose of promoting an awareness and appreciation of local and regional artists. The Art Museum of South Texas houses a permanent collection of more than 1,500 paintings, sculptures, prints, illustrations, ceramics and more within its striking facility that overlooks Corpus Christi Bay. More than just the permanent fixtures, the museum showcases rotating exhibits of works by regional and international artists. A Hesters Café provides a view of the Corpus Christi bay and the USS Lexington is on-site, as is an outdoor courtyard with awesome patio seating. The Aurora Arts Theatre offers theatre- lovers an experience tailor-made for an unforgettable night of entertainment. Seating just over 100 patrons, this black box studio theatre provides an incredibly immersive evening that makes patrons feel like a part of the production. Be sure to check out the yearly production of The Rocky Horror Show - a local favorite - every Halloween season. 100 block of Carrizo St.
At an impressive 1,240 feet, this pier extends proudly into the Gulf of Mexico and serves as a hub for many avid anglers and outdoor enthusiasts. Bob Hall Pier is open 24 hours a day/7 days a week. The Pier Bait Shop is open Sunday through Thursday from 7:30 a.m. – 11 p.m. and is open 24 hours on Friday and Saturday. If you would like to bring your own fishing pole, you may bring it on the pier for $4 per pole or pole rentals are available through the Bait Shop. Parking is free. Centennial House aka the Britton-Evans House was built in 1849 by Rebecca and Forbes Britton on land acquired from Col. Henry Kinney, the founder of Corpus Christi. Centennial House is the oldest structure in Corpus Christi still on its original site. In 1862 during the Civil War, the house served as a Confederate hospital. It was also used as a hospital and officers' mess hall for the Federal Army in 1866. Open for tour only the first Sunday of every month from 12:00 p.m.-4:00 p.m. Located along Ocean Drive in the heart of Corpus Christi, Cole Park is a family-friendly park perfect for a few hours of fun. The waterfront park features a large playground, amphitheater, ample green space for recreational play and a trail for walkers, runners and cyclists. If you’re looking for a place to picnic, Cole Park includes grills on-site. Free parking is available on either side of the park. Cole Park is also home to the Corpus Christi Skatepark, a 10,000 square foot concrete skatepark beside the beach that features a street section and bowl section. Consider stopping by the amphitheater in the summer for the Bay Jammin Concert & Cinema Series during the summer months! Located along scenic Shoreline Blvd., this waterfront wall and promenade is a sight unique to Corpus Christi. You can jog, bike or simply meander along the 1.5 miles of path while taking in some great views of the waterfront. Sink your feet into the sand on McGee Beach overlooking Corpus Christi Bay, relax in one of the “miradores del Mar” to take in the ocean view or take a stroll through the planets in “Journey Through Our Solar System,” a new exhibit along the Downtown Seawall. Discover the history of South Texas through exhibits of fossils, photographs, works of art and more at the Corpus Christi Museum of Science and History. Find out what makes this part of the Lone Star State unique as you wander through the museum’s 12 exhibits, like the shipwreck and the Hall of Earth Science. If you have kids, take them to the HEB kid zone where then can play and learn inside the huge DNA-model playground. Would you like to explore and learn the history of Corpus Christi? Try one of the many tours Enjoy Corpus Christi Tours has to offer! Settle in a climate control spacious touring van for sightseeing historical, art or ghost tours of the city. Custom tours and specialized group tours are also available. Fun Time watersport rentals is located in the heart of Corpus Christi’s bay front on Lawrence Street on the T-Head. Rent everything from jet ski’s, paddle boats, kayaks and canoes to speed boat rides and dolphin sighting trips. The sunny weather and warm water a great day for Fun Time Rentals. Funtrackers has race cars for kids of all ages, as well as a Pro Track for the adults. Test your skills at the 18-hole miniature golf course, bumper boats, miniature golf and a mechanical bull. The arcade houses over 80 games to play, with chances to win tickets redeemable for prizes. Kiddie rides also available for children ages 10 and under. 9605 S. Padre Island Dr.
Hans & Pat Suter Wildlife Refuge, located on Ennis Joslin and Nile, offers nature lovers an ideal spot to observe birds and wildlife along Oso Bay. Take a walk on the 1-mile nature trail and an 800-foot boardwalk for good views of Oso Bay, grassy marshes, woodlands and mudflats. Picnic tables and viewing platforms are spread throughout the refuge for visitors to enjoy. Epic tales, captivating songs and the bright studio lights bring the Harbor Playhouse to Life! Shows like Les Miserables and Chicago are offered alongside performances like Shrek the Musical and Annie, providing a broad appeal for theatergoers of all ages. A full show schedule and an online box office are available on the Harbor Playhouse’s website. Harrison’s Landing offers a variety of boat tours including the Texas Tease a 74’ party boat that tours the Corpus Christi Bay and is available for private charter or climb aboard the Nell Betty II to experience sailing the warm waters with dolphin watching tours. Want a relaxing tour of the scenic bay then schedule a trip on the Japonica, a 50’ open air touring boat that allows you to see the lights and breathtaking views of Corpus Christi Bay. Corpus Christi’s Northwest side offers some of the best bird watching opportunities for bird lovers. Located on the Nueces River, Hazel Bazemore Park offers hawk watchers and bird enthusiasts a prime location to see birds migrate. Each spring and fall people gather to watch thousands of hawks fly overhead. The 77.6-acre park also includes a wetland, pond, and woodlands. Birding blinds are located throughout the park. Several major flyways converge at this one location, making Hazel Bazemore Park one of the most unique locations in the nation for Hawk watching. The site of twelve historical Corpus Christi homes, the oldest dating back to 1851. Many of the homes are recorded Texas Historical Landmarks, and each is beautifully restored and is a tribute to the ethnic diversity and culture of the area. The Galvan House hosts and supports many art and cultural activities and events. The Multicultural Center includes the Galvan House, the Courtyard, Central Plaza and the Lytton Memorial Rose Garden. Make a stop at the Visitor Information Center in the Heritage Park Merriman-Bobys House for more information about the park and Corpus Christi! Did you know how Mustang Island got its name? Wild horses ran free as recently as the 1800s. 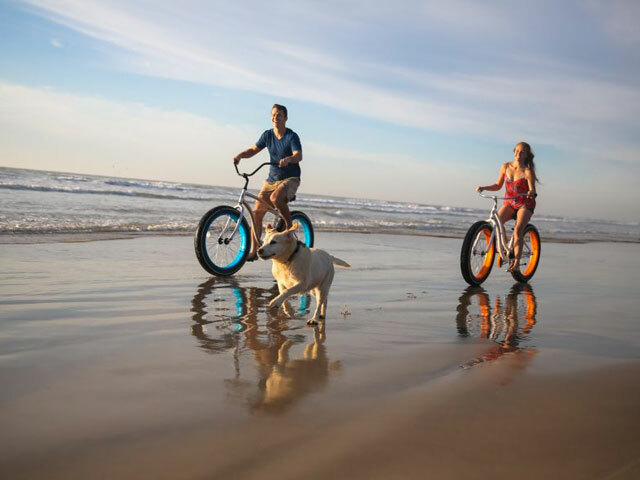 Neighbor island, Padre Island is the home of this family-run, reservations-only attraction that affords visitors that ultimate way to see the coastline, atop a gorgeous happy healthy steed. We challenge you to find a beach experience that is so quintessentially Texan! The stables are located just south of Bob Hall Pier/Padre Balli Park. 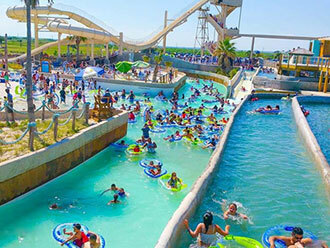 16499 S. Padre Island Dr.
Hurricane Alley Waterpark is Corpus Christi’s hometown water park! Located in the SEA District next to Whataburger Field on Port Ave., Hurricane Alley brings hours of fun family entertainment to Corpus Christi. From slides to surfing, Hurricane Alley has something for the entire family. For more information regarding Hurricane Alley Waterpark and the upcoming season, please visit www.HurricaneAlleyCC.com. The Kemp's ridley sea turtle is the most critically endangered sea turtle in the world, and the Padre Island National Seashore is the most important Kemp's ridley nesting beach in the United States, in terms of the total number of nests located. Every year, the Kemp’s ridley sea turtles come back to nest and restore what was once a diminishing species. In an effort to save the species, eggs are collected, incubated and released at the Padre Island National Seashore. Watch the baby sea turtles waddle along their first journey into the Gulf of Mexico! K Space Contemporary is a non-profit organization dedicated to presenting and promoting contemporary art. As a forum for creative exchange and experimentation, they aspire to educate and build awareness for innovative art in South Texas often providing a forum for under-represented artists whose works are experimental and non-commercial. Hours: Open Wed-Sat 11am-5pm. Welcome to La Palmera, the place to shop in the Coastal Bend! La Palmera features the most popular national retailers and specialty shops including Dillard's, Macy's JCPenney, Francesca’s, H&M, Charming Charlie, Michael Kors, Pandora and White House | Black Market. Guests will also find full service dining options such as P.F. Chang's China Bistro, LongHorn Steakhouse, Chili's Grill & Bar, and Grimaldi's Pizzeria, as well as a variety of choices in the La Palmera Cafés Food Court. The Lozano Golf Center is located just minutes from downtown Corpus Christi and features an 18-hole, par 72 regulation course and a 9-hole, par 30 executive course. Built in 1965 by Leon Howard and renovated in 1983 by Finger Dye Spann, Inc. it is the course that fits your time frame and skill level. With a good mix of straightforward golf and demanding holes on the regulation course and the ability to practice your short game or a quick round on the executive course covers all the bases. If you’re looking for somewhere close to downtown, look no farther than McGee Beach. Located on the Corpus Christi bay, this bustling beach is typically free from seaweed, clearing the azure waters for a picturesque view and great swimming. The location is superb and convenient rentals are nearby. Children and adults alike can enjoy the calm waters. Five miles of pristine sand and surf can be found in Mustang Island State Park, a natural area located on Mustang Island just east of Corpus Christi. Along with relaxing on the beach and swimming in the warm water of the Gulf of Mexico, you can explore the park by hiking, bike or kayaking on 20 miles of paddling trails. Piers and shallow-water areas provide plenty of great places to fish and tons of primitive and drive-up campsites provide room for those who want to spend a night on the beach. Spend a day playing in the water with a variety of summer beach rentals while working on your tan. Then take a scroll on the boardwalk and you’ll have your choice of places to eat and fun souvenir shops to browse. North Beach is walking distance to two of the top attractions in Corpus Christi: the USS Lexington Museum on the Bay and the Texas State Aquarium. Oso Bay Municipal Golf Course is an 18-hole John Bredemus design that sits along the Cayo de Oso watershed. A very player friendly course with flat terrain and a location that lends itself to the bay winds with water coming into play more predominantly on the back nine. The Oso Bay Wetlands Preserve & Learning Center is a 162-acre nature preserve dedicated to furthering knowledge of the flora and fauna of South Texas. Come and explore the 4 miles of nature viewing trails and walk away with a new found experience and understanding of the importance of protecting the wetlands for future generations. Visit our website to learn about our summer events including Guided Nature Walks, Nature Story Time for ages 2-8 and Observe Science Outdoors (OSO) weekly camps for ages 5-14. Nike, Brooks Brothers, Express, Zales, H&M, Sketchers and more! Find the brands you love for a whole lot less in this beautiful open-air, village-style shopping center. Plus, convenient parking, kid’s play area and Curbside Food Truck Pavilion. Find it all at the Outlets just 18 minutes from Downtown. If you’re looking for a day of sun and sand then Corpus Christi, Padre Balli Park should be at the top of your list. Padre Balli Park is home to Bob Hall Pier which extends 1,240 feet into the Gulf of Mexico. The park offers free parking, rinse showers and a bath house for enjoying the perfect spot for camping, fishing, swimming or surfing. The Padre Island National Seashore holds the distinction of being the longest stretch of undeveloped barrier island in the world. More than 70 miles of coastline, dunes, prairies and tidal flats are protected within the park, providing a critical home for 380 bird species and a variety of sea turtles, including the endangered Kemp’s ridley sea turtle. The seashore is as rich in things to do as it is in wildlife. Swimming, fishing, birding and even sea turtle hatchling releases are just a few of the many activities at the seashore, which is open year-round. Palmilla Beach Golf Course, an 18-hole links style championship course situated on the Gulf of Mexico that offers golfers not only amazing views of the ocean and Corpus Christi Bay, but has taken full advantage of the land and elements indigenous to this area and created an incredible golf experience every time you play. Over 6900 yards from the back tees this par 71 golf course is an Arnold Palmer Signature Design and was voted “One of the top golf courses you can play in Texas” by Golf Week Magazine and is a Certified Audubon Cooperative Sanctuary. Schlitterbahn Riverpark and Resort has something for everyone with over a mile of rivers that can be accessed by 16 beaches that are all interconnected. Get your adrenaline pumping while you soar through the Sky Blaster water coaster, ride down the White Water Express tube slide or enjoy a relaxing float down the Comal Pass lazy river. Test your surfing skills at the Boogie Bahn or have the kiddos enjoy that uphill blasters park and splash zone. There's so much more to see than the sea in Corpus Christi. Do you know just how far Jupiter is from the Sun? What did Columbus' ship look like? Have you seen our historic district? Easy, fun and utterly entertaining you'll be talking about SegCity's award winning city tour for years to come. So what are you waiting for? Stop reading. Get riding! Learn about the transformative career of Selena Quintanilla at the Selena Museum, the popular cultural attraction that preserves the memory of the Queen of Tejano music that once called Corpus Christi home. Browse the museum’s exhibits and you’ll see Selena’s awards, stage outfits and other memorabilia, as well as her legendary bright red Porsche. Gorgeous gardens blend with protected natural areas to create the South Texas Botanical Gardens & Nature Center, a 180-acre display of the Texas Gulf Coast’s beautiful flora and fauna. The nature center features 12 unique exhibits including the butterfly house and orchard room to immerse you in the allure of the region. Step onto the Wetland Awareness Boardwalk for a breathtaking view of Corpus Christi’s coastal wetlands, then tour the Plumeria Garden & Willoughby Viewing Platform that is home to more than 100 fragrant tropical plumeria that are native to the Caribbean. The facility is also a key site in the Great Texas Coastal Birding Trail, making it a fine place to go birding. The mission of the Tejano Civil Rights Museum is to preserve and educate the public about the rich history of the Tejano and Mexican-American culture rooted in the South West. Six rooms in the historic Heritage Park house are filled with artifacts, including historic maps, photos and art. Each month the museum features a collection from a Hispanic artist. Get up close and personal with the many animals that call the Gulf Coast home at the Texas State Aquarium. Watch live educational demonstrations with otters and dolphins, feed and touch a stingray and see four species of sea turtles swimming in a lagoon. Along with all the aquatic critters, you’ll meet the majestic residents of Eagle Pass, including Grace a bald eagle and Cowboy a crested caracara. The new Caribbean Journey is a must see! While you are there, say hi to Xena and Chico the Linnaeus’s two- toed sloths at the exhibit. An inviting portal to the Far East exists right in the heart of the Corpus Christi Bayfront. The Texas State Museum of Asian Cultures & Education Center offers you a first-class ticket for a few dollars and an hour or two of self-guided tour time. With hundreds of miles of coastline, Texas has as much claim to being a surfer’s paradise as anywhere else in the country. Texans have surfed the Lone Star State’s scenic shores for decades, a history that can be explored at the Texas Surf Museum. Check out the exhibits that relate the general history of surfing - and Texas’ unique part of that story – and catch a film in the projection theater. If you’re a surfing enthusiast, or you want to see a unique free Corpus Christi attraction, make a visit to the Texas Surf Museum. The Water's Edge is the one of the newest 30 acre parks in Corpus Christi. With the first gated dog park in the downtown area your pooch can have a great time too! Kids will love The Water’s Edge while playing on the new playground area just seconds away from McGee Beach. If you get hungry stop by the food truck court right next to the dog park and playground area. Head to Treasure Island located just minutes away from the Gulf of Mexico beaches and next to padre islands most popular mermaid. Treasure Island offers an outdoor mini golf course themed as Treasure Island and an indoor arcade room. Pass over Corpus Christi’s Harbor Bridge and you’ll see a massive Essex-class aircraft carrier just a stone’s throw away from the shoreline. The USS Lexington nicknamed “The Blue Ghost” played a key role in battles across the Pacific Ocean during World War II. Today, the warship is a museum full of educational exhibits of uniforms, vintage aircraft, pictures, and more that tell the story of the ship and her crew. Five distinct areas of the ship can be toured, including the flight deck and the lower decks, giving you a sense of the Lexington’s size and scale. The ship is open year-round and guided tours are available. 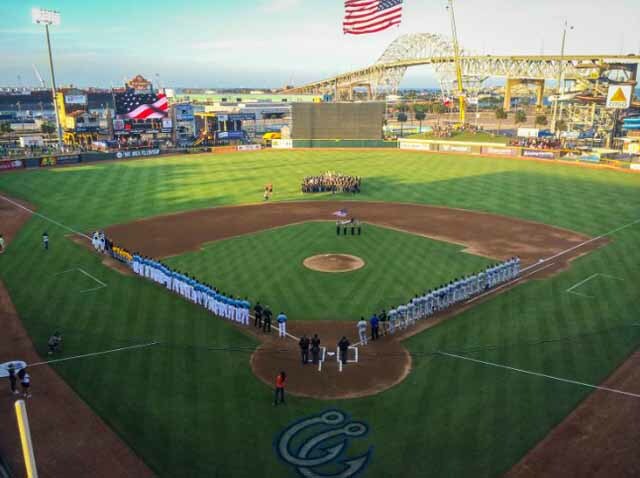 Get your peanuts and cracker jacks and watch up-and-coming baseball talent at the state-of-the-art Whataburger Field, home of the Corpus Christi Hooks. The Hooks are the Double-A Texas League affiliate of the Houston Astros and play about 70 games at Whataburger Field between April 7 and Aug. 29. Tickets are available on the Corpus Christi Hooks’ website. Windsurf the longest undeveloped barrier island in North America. Only a short drive from Corpus Christi, Texas Worldwinds is located in the Padre Island National Seashore at Bird Island Basin. This half-mile stretch of beach on the protected Laguna Madre is internationally recognized as one of the top windsurfing sites in the mainland U.S.A.